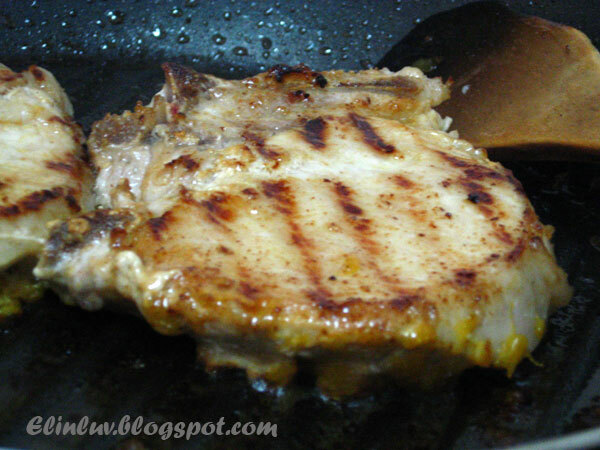 place the marinated chops on it and pan grilled till the chops are cooked. and using reduction method cook till the gravy has thicken . on the top surface of the chops . as serve as a side dish...yummy ! While pan grilling the chops , I prepared the braised cabbage on the other stove . 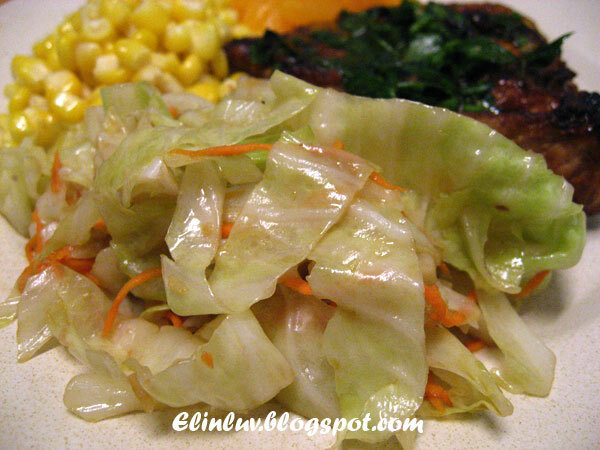 Stir fry the shredded cabbage with carrots shreds with lots of garlic and sea salt to taste. 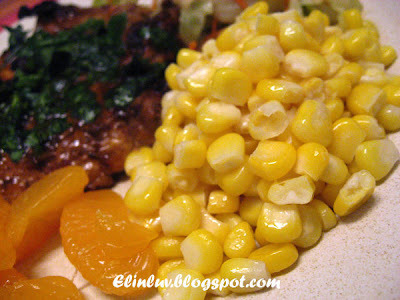 Add 1/4 cup of water and simmer under low heat . When ready , add 1 tbsp of balsamic vinegar and stir fry till well combined. Easy does it and yet this is so delicious. * I am too lazy and tired to rewrite the method here....please read above :p and you will get the gist of it. Have fun reading it ! 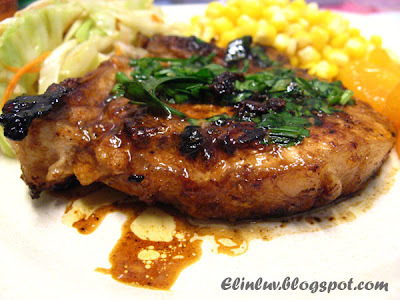 Elin, how I wish you can serve me this right now! I'm so darn tired to cook anything. Have been busy for the past few days. Gosh, salivating already! Btw, Jo can cook very well too huh! hehe... I went through her blog. Guess, she's enjoying her life there so much right now. Ah, just 4 months only then she'll be back! Hope you're having a wonderful day. the pork chop looks so gd, drooling now..
A mouthwatering pork chop dish! My man is a pure carnivore too. I often have to cook separately for us. esp. in the summer time. Wah!! This looks super delicious! You really cook very nice food! Admire your cooking passion! 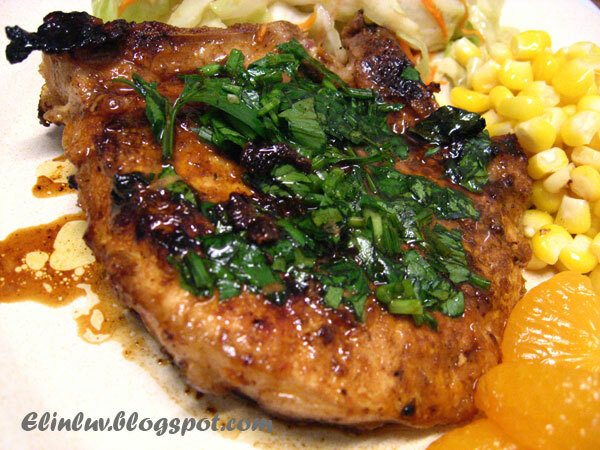 The pork chops look really good! I'm quite used to cooking for 2 now. If I cook Chinese, stews or braised stuff, I usually cook more and pack the leftovers for my hub's pack lunch. Lazy? Man, I'll take this!! This is exactly what I am looking for tonight !! :) Thanks for recipe. 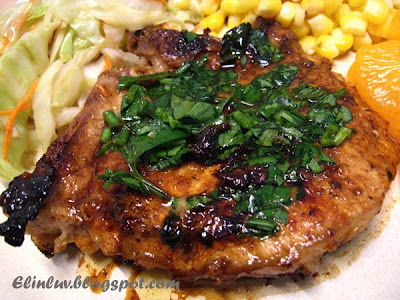 Hi Elin, the pork chops looks awesome,and the braised cabbage with balsamic vinegar, great! This is making me hungry now and it's only 8:36 a.m. (just had some breakfast) My husband loves eating meat too, I sometimes have to cook separately. 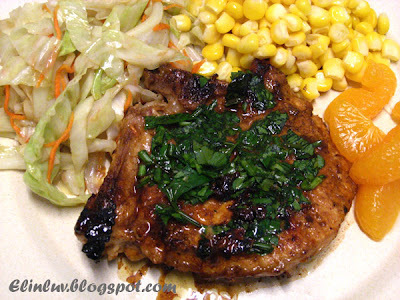 Those pork chops are totally mouth-watering! An excellent meal! Elin, if you're having a headache thinking of what to cook for dinner for the 2 of you, you can always give me a call and we'll join you! Kristy....haha hope u had a wonderful birthday :) yup soon she will back...after her sem ends and after her eurotour...say maybe in December ! Yay...can't wait for her to be back. She is hoping time slow down a bit for her LOL! She is enjoying herself so much. Angie....I sometimes do that too ! 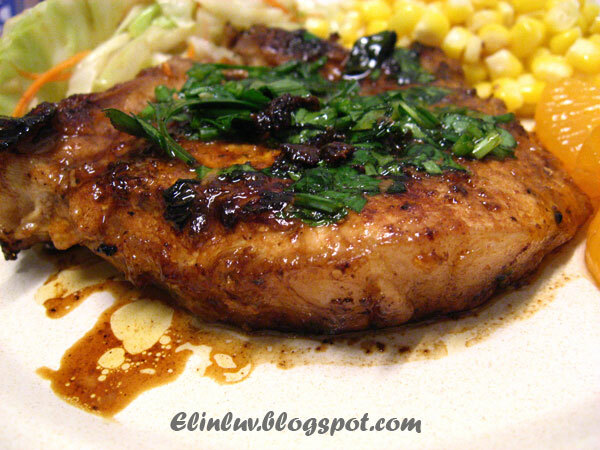 Madin...yeah..balsamic goes well with salad and meat too ...lovely taste! 5 star foodie...hahah yup it is delish ! Tanantha...we are in the same boat then...Korean dramas are addictive alright ! Cheah...:) sure if you can stand my kind of cooking LOL! look juicy and appetizing!! I don't mind to have a bite of that too!! Love your balsamic reduction on the pork chops! Now don't start me up on all those dramas! Guess what my missus does very night...and how I have to suffer! Sobsss!!!! LOL!!! Ya, even at home, I always tell my missus - no need to cook anything special, no need to cook a lot - just enough, anything simple - only the two of us...not worth the trouble.